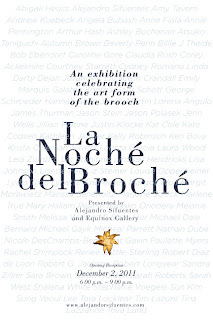 I am honor to be part of this wonderful exhibition La Noche del Broche at Equinox Gallery in La Villita in San Antonio, Texas. The exhibition will display 100 brooches from 86 artists. 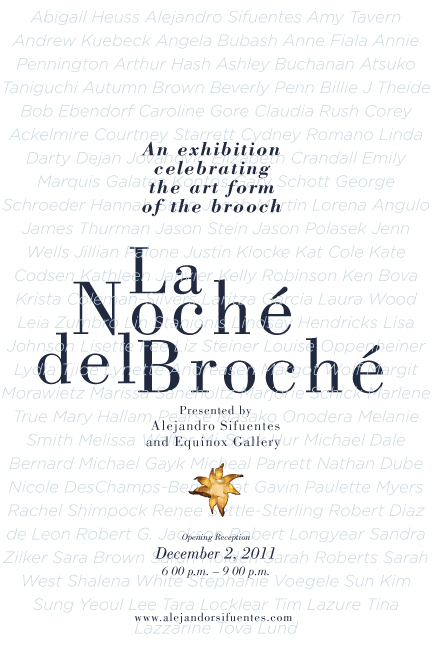 La Noche del Broche is curated by Alejandro Sifuentes and guest artists Jillian Palone, Laura Wood and Gary Schott. The opening reception is December 2 from 6 pm to 9 pm and the exhibition will be in the gallery from December 2 to January 5. The exhibition can also be viewed online in the Equinox Gallery Website. "The inspiration for La Noche del Broche came from an idea of having one night to commemorate the brooch and its art form in a festive atmosphere where Spanish Music and Dancers would collaborate to create an atmosphere of Celebration !!! Models would be colorful and adorned with brooches celebrating the human spirit. 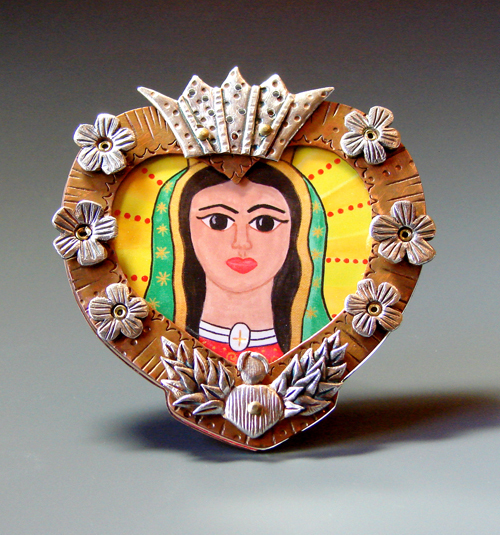 This exhibition is an opportunity for artists to honor and celebrate the art form of the brooch. For this vision to be appropriately achieved, we would need a large collective of brooches each one expressing the multiplicity and individuality of the creative essence. 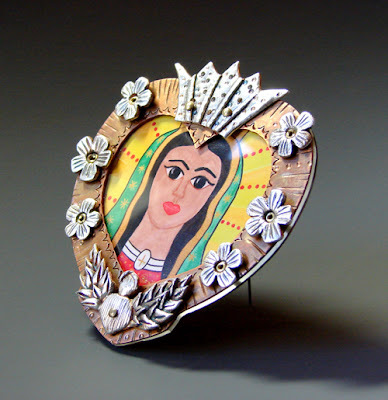 Equinox Gallery serves as a meeting place to showcase Jewelry and Metalwork in San Antonio. Our Mission is to exhibit and educate the community by providing a platform for the diversity in the field of Metalsmithing." Come and visit the exhibition ,I am sure you will have a great time !